Is it your first time paddle boarding? Read this first. Like most sports, paddle boarding looks easier than it is. That’s not to say it is difficult, but you’ll have a lot more fun if you avoid the mistakes most newbies make. Why waste your energy putting effort into the wrong things? Follow these tips and enjoy how good paddle boarding makes you feel and the positive effects it has on your body and overall fitness. It’s all about your back, core and legs – Newbies tend to lean forward and mostly use their arms which is tiring and not very effective. Engage your core. Stand up paddle boarding is a full body experience, so bend your knees, engage your back and twist your core. The video below demonstrates how to use the right muscle groups to generate speed and paddle efficiently without fatigue. Look At The Horizon – Sounds obvious but you’d be surprised how many beginners look down at their feet/board the whole time. It is tempting to look down at the water (mostly to make sure you won’t fall in!) but remember your body follows where you look. Keep your back straight, head up and balance your body weight over your toes. Looking down sends your weight back to your heels meaning you are more likely to end up in the water! Put The Paddle In The Water – Again this sounds obvious, but we see a lot of beginners putting the paddle only half in the water which means a lot of water being splashed around but not much power. The idea is to develop long, powerful strokes so you are gliding along. Reach forward and finish the stroke not much past your feet. 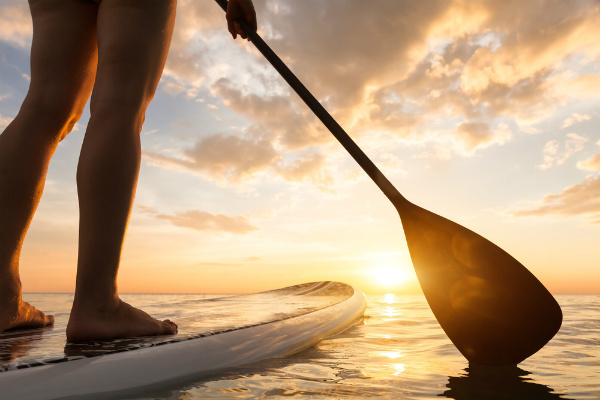 Discover more stand up paddle boarding tips and SUP safety essentials. Ready to get started? If you’re visiting Jervis Bay you can hire a stand up paddle board from us or take one of our SUP guided tours. We supply all the essential equipment (Stand Up Paddle Board, Paddle & Life Jackets), you supply the sense of adventure! No previous experience is required, but an ability to swim with confidence is essential. Got a question? Please don’t hesitate to contact the friendly team at Jervis Bay Kayak & SUP Hire.